CD review: "Stranger in This Place"
Forget the name of the band, and let go too of the skull-and-crossbones insignia on the cover slip from your mind. Concentrate instead on some of the best, most rocking country this side of Hank Williams Jr.
Fronted by vocalist/songwriter Alan Wooley, Killbilly is to American country what the Pogues are to traditional Irish folk: a revitalizing shot in the arm. 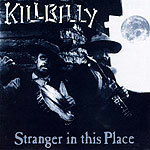 Like their Irish musical brethren, Killbilly is firmly rooted in traditional American rural music. Stephen Trued is one of the best banjo pickers you'll hear, and Harris Kirby is likewise fine on mandolin. The 10 original songs are accessible without being shallow; each is written with a timeless, seamless sense of style that sounds as if it was a classic we've heard a thousand times rather than a brand-new song. Also like the Pogues, Killbilly takes those traditional forms and instrumentation and breaks it out with a rock-steady beat and uptempo rhythms. It's pretty infectious stuff, and it isn't hard to imagine their live shows must be pretty wild. If you like your country with a bit of outlaw in it, mixed together with a dash of rock-and-roll bravado, Killbilly is very much worth checking out.